Also available for rent short term – two weeks in June for $37,500, two weeks in July for $65,000, first two weeks in August for $82,500, and last two weeks in August for $85,000. 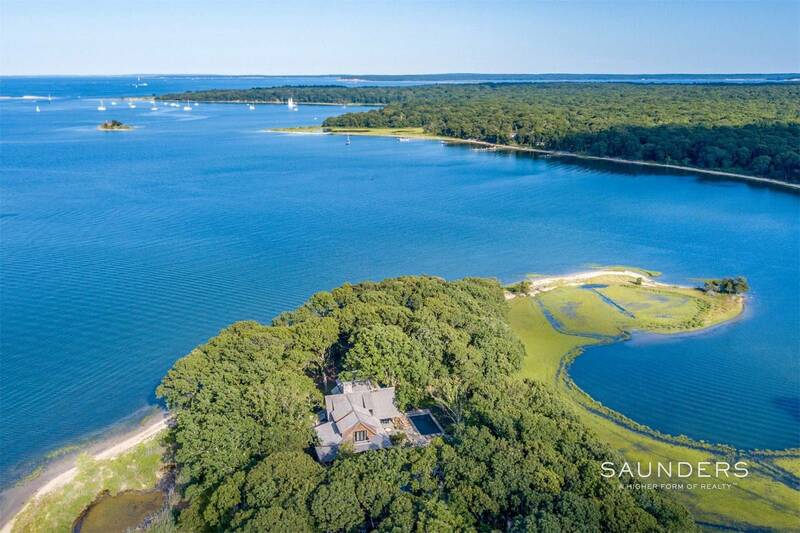 In one of the most pristine natural settings on Shelter Island, Congdon’s Point is a hidden treasure, located down a long and winding drive, perfectly positioned on its own peninsula with 443 ft. of shoreline on Coecles Harbor, with views to Reel Point and Mashomack Preserve. 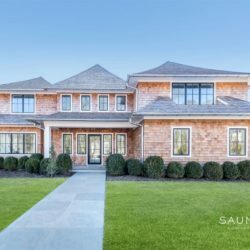 The home captures the beauty of its unique setting with reclaimed New England hardwood and artisanal, handcrafted finishes, juxtaposed with thoughtfully upscale amenities. The focal point is the living room, which has 24 ft. ceilings and massive, nearly 10 ft. tall windows with water views to each side of the peninsula and doors to outdoor entertainment areas. The kitchen, equipped with Thermador Professional series, has been designed with both the professional chef and family barbecue in mind. 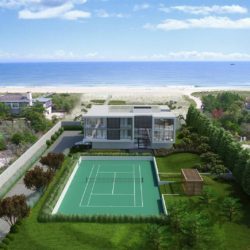 There is a first floor en-suite master bedroom, replete with stunning 180-degree harbor views, beverage center, expansive spa-like bath with steam shower, Sardoni water closets, electronic privacy shades and private outdoor deck. The second floor offers two additional guest bedroom suites, the East Suite which has sunrise views and the West Suite, with sunset views, and a cozy and fun bunk room with built-ins, full of nostalgia. The covered porch, nearly 1,000+/- sq. 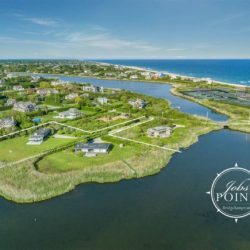 ft. and wrapping almost the entirety of the home, overlooks an 18′ x 30′ Gunite pool, 7′ x 9′ attached spa and the waterfront, where long legged wading birds, osprey and bald eagles are regular visitors. A stone veranda off the dining area offers inspiring vistas for both morning coffee and evening cocktails. 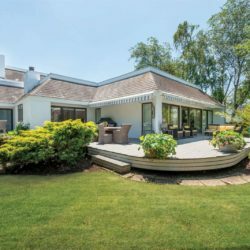 The boat house has a billiards table and entertainment bar with panoramic views framed by windows on three sides, plus a second floor guest suite with library. A 100 ft. dock awaits down a short path near the sandy beach area, and accommodates four boats of up to 40 ft. long, with additional moorings just off the dock. Congdon’s Point is truly a one of a kind home for your one of a kind, resort style luxury vacation. Also available for two-week rental.